With all the wars going on in the Middle East and the Arabic world, nowadays there is hardly any attention paid to the sad situation of the Palestinians. Most people would say that the most important problem in the Middle East is the struggle between the Sunnis and Shiites. Does Hierarchy still see solving the problems of the Palestinians as “the most important problem facing men today”? Q. How can an individual help in the refugee crisis? What can we do? We feel helpless and frustrated as well, of course, as very sad to see so much suffering. A. It is common sense – if you are moved, you find a way, and do what you can to help, in any way you can. You would be surprised how much Maitreya is doing to help the whole situation. Q. Are the recent bombings in Brussels, Belgium, also opening the hearts of men and accelerating the emergence process of Maitreya (like the Paris attacks in November 2015)? A. Yes, to some extent. Q. At the time of the terror attack in Zaventem Airport in Brussels, a third bomb was found which did not explode. Did the Masters manage to prevent its explosion so as to limit the damage – since it was the biggest bomb? A. The Masters did not prevent the bomb from exploding – it was very good luck. Q. Does our guardian angel evolve, along its own line, as we evolve? Q. Is the guardian angel already present or ‘near’ at or around the time of conception? Or does it begin its contact with the foetus as the baby reaches a specific stage in development? A. It is present from birth. Q. (1) For the Law of Karma to work the guardian angel must be subject to the Law, just as much as the person is? (2) In other words, is it true that we cannot always be protected by the guardian angel since karma needs to be worked out sometimes in what we may think of as an accident? Q. Do we always have the same guardian angel through all our incarnations? Q. If so, does that mean each time we come back into incarnation we re-establish (unconsciously, of course) our relationship with the same guardian angel? Q. In Raja Yoga or Occultism by H.P. Blavatsky, on page 32-33, she writes of four types of Esoteric Knowledge or Sciences: “(1) Yajna-Vidya, knowledge of the occult powers awakened in Nature by the performance of certain religious ceremonies and rites; (2) Mahavidya, the ‘great knowledge,’ the magic of the Kabalists and of the Tantrika worship, often Sorcery of the worst description; (3) Guhya-Vidya, knowledge of the mystic powers residing in Sound (Ether) … a magical performance based on Knowledge of the forces of Nature and their correlation; (4) Atma-Vidya, a term which is translated simply as ‘knowledge of the soul,’ true wisdom by the Orientalists, but which means far more. This last is the only kind of Occultism that any theosophist who admires ‘Light on the Path’ and who would be wise and unselfish to strive after.” Would Transmission Meditation be an Atma-Vidya occult practice? Q. The term yoga is understood to mean union. Would meditation be classified a yoga that, unlike Hatha Yoga which is understood to bring into union the dense physical and etheric double, is a union between the personality and the soul? Q. In Chinese history there are many stories of the Five Sage Emperors – Huangdi, Zhuan Xu, Yao, Shun, Yu (ca. 2852-2197 BC). Some think they were only mythical figures, but their qualities and characteristics seem so similar to Hermes, Zoroaster, Homer or even Krishna, and probably others on your list of great initiates. Am I right, that all of the Five Sage Emperors were actually real men? Were some of them Masters? A. They were real men – ‘enlightened men’. On Saturday 13 February 2016 our group had a booth outside the entranceway to the main Vancouver Public Library. It is a good location as there is a great flow of people who pass the stand during library hours. As I was working alone at the table, a number of people stopped, took free handouts, and chatted. At one point, I was talking with a young man when I noticed three men standing just slightly away from the table. They were talking amongst themselves and every once in a while would look and gesture at our table. They came closer to the table and began looking at the handouts, took some, and moved away to where they had been before. I finished talking with the young man and sat down behind our table. I could see the three men standing directly in front of me and found my attention being drawn to them. One man, about mid-thirties, was tall and maybe of Asian nationality; a younger man was in his early 20s and looked as though he was from India; the third man was in his late 60s or early 70s and looked as though he could have come from anywhere in the Asian region; he had glasses and greying hair. I couldn’t hear what they were saying, but it was a calm, earnest discussion, with the elderly man doing most of the talking. The tall man seemed to be sceptical, but unemotional. The young man was keenly following things and joining in from time to time. Every once in a while, they gestured and looked at our table. Suddenly, I heard the elderly man say: “the Lord Maitreya.” This surprised me, as I have heard only a few people refer to Maitreya as “the Lord Maitreya”. From that point on, I heard snippets of his conversation. He said: “People think Maitreya is out there,” he gestured into the air, “but He is in here” (he placed his hand on his heart). He mentioned that the Theosophical Society didn’t believe about Maitreya, plus he said something about Krishnamurti. It seemed to me the man was giving a presentation about Maitreya to the other two. It was something I had never seen before: someone I didn’t know telling others about Maitreya. They were there about 20 minutes, and then they parted amicably, and each went in separate directions! As they were leaving, I started to wonder if those three men had been someone ‘special.’ Could the Master confirm whether or not the three were indeed ‘special’? On 12 December 2015, our group held an all-day event at the main public library in Vancouver. We had an information table set up on the concourse just outside the library, and we had also rented a room downstairs, in which we had various display panels and some video segments of Benjamin Creme speaking on different aspects of the Reappearance story playing in a loop; the idea was that we could direct the public who came to the information table to go to this room to explore our information in greater depth, where group members would be available to answer questions and provide more information. During the day, co-workers and I took turns, moving between the two locations, so that we had a chance to interact with the public in different capacities. A number of people stopped at our information table over the course of the day. We had some good conversations with people who seemed genuinely interested; some visited our multi-media display in the room downstairs and one man even said he was going to check for some of the books in the library. He returned shortly afterwards with three of Benjamin Creme’s books, eager to read them and learn more. However, we also had a few exchanges with people who were particularly belligerent or argumentative; and by the end of the afternoon, I was really feeling as if I’d just had enough. Then I noticed a group of four approaching. How pleasantly surprised I was by their warmth and genuine interest, as they started to look over our material! The one man among them picked up one of Benjamin Creme’s books and started to leaf through it. I started to tell them about Maitreya and Benjamin Creme’s books, and mentioned that I’d heard about this information in 1982 and had been involved in presenting the story to the public ever since, adding: “Probably from before you were born!” since it suddenly occurred to me that he was quite a young man. He replied that he’d “come onto this earth” in 1984, and we laughed. I told them that Maitreya advocates sharing the world’s resources as the way to solve many of our problems and the man made a little joke out of the name of the magazine, saying: “International Sharing.” The other women with him made a few comments, one referring to the climate talks which had just finished in Paris. All of a sudden, I was overwhelmed by the gentleness and warmth of these people, and couldn’t help saying: “What a lovely group of people you are. You all have such lovely eyes.” They were looking at me so sweetly and sympathetically, just beaming, in fact, that it was all I could do to hold back the tears, it affected me so deeply. This may sound rather silly, and maybe it was just the contrast between them and the last difficult encounter I’d had, but they seemed so delightful to me. One of the women thanked me for what I was doing and the others exchanged parting words with me and they all walked away together and into the library. I sat down again to think over what had just happened and had the very strong impression that these lovely people might have been spokespeople? I would also like to take this opportunity to express my deepest and most heartfelt gratitude to you for all the work you have done and continue to do. On 27 March, Easter Sunday, my two granddaughters, both in their early 20s, arrived unexpectedly at 2pm. Samantha wanted to show me an App on her phone of an “Anonymous Prayer” which she had found very moving. The prayer urged us to help the refugees and pray for them. We chatted and I completely forgot about the 3pm Blessing from the Lord Maitreya. We were in the conservatory. Suddenly, the sky darkened, there was a clap of thunder, and lightening lit the room. She had found the prayer on her phone and as we listened to the uplifting words in the storm, I glanced at the clock and it was 3pm. All three of us were visibly shaken by what we had felt at that moment. It was as if a white light had filled the room and our bodies. Were we blessed, dear Mr Creme? It did feel like it, but imaginations can run high! Grateful thanks for all you do for mankind. L.L., Brighouse, West Yorks, England, UK. On Sunday 13 December 2015, we were preparing to host our last public workshop of the year, on Transmission Meditation at The Salisbury Centre in Edinburgh. We started a bit later than usual due to a few late arrivals, two of whom were young men who sat quietly throughout the duration of the workshop. Both were casually dressed and did not ask any questions or make comments and had a quality of detachment about them! At the end of the workshop they introduced themselves as 'Chris' and 'Daniel' when prompted by someone else who attended the event. A. and I had been reflecting en route to the workshop on the biblical story of Daniel, and after the event had finished, we wondered if these two young men may have been 'special' people? Anna had also been thinking about the name Chris/Christian/Christ during the group meditation that took place during the workshop. C.P. and A.S., Edinburgh, Scotland. Recently I recalled an experience I had a few years ago while ‘postering’ for one of our group events. I drove from my home to one of the city’s more popular areas. While crossing a bridge I noticed a young man with long curly hair and a huge, beaming smile walking across the bridge the other way. He seemed to be looking directly at me and I smiled back. In a few minutes I reached my destination about two kilometres down the road. I started putting up posters. Behind me I heard a voice say, “Maitreya! Cool!” I turned around, it was the same person I saw earlier crossing the bridge. I said he should check it out and went on my way. Feeling inspired I wondered how he could have travelled two kilometres in such a short time to give a little encouragement. Was he a Master or one of their spokespersons? I have received a message from T.W. (a long-time supporter who regularly writes letters about Maitreya in his local Congleton paper) who is now in Leighton Hospital in Crewe. He related the following story. We wondered if he might have been visited by someone ‘special’? On Tuesday 22 March 2016, the evening before the Easter full moon, I was sitting in my living room, when I glanced out of the window and saw a ball of light in the distance across the countryside. It was about 6.30pm and not quite dark. I was tempted to find my binoculars but realized I should just watch it. It was a beautiful cherry red colour, exactly the colour of a light I had seen in the same direction before, which had been confirmed by your Master to be a spacecraft [see Share International, March 2013]. It seemed to be there quite a while although it was probably only just over a minute. It remained in the same position, then seemed to move slightly closer as it quickly faded away. I felt very blessed to see it. Thinking about it afterwards, I realized that I had recently been looking out for it, thinking that I would love to watch it for a longer period than last time which was just a few seconds. Please can your Master tell me any more about what I had seen and experienced? On Friday 2 October 2015 after Transmission Meditation we saw a star low in the sky. We watched for a while and saw it move, change colour and become surrounded by what looked like flashes of light. Unfortunately, when we went to get a camera it disappeared. Was it possibly Maitreya’s lightship? M.otN. and N.B., Bilthoven, the Netherlands. Before the German group meeting started on 5 February 2016 we distributed flyers in the city of Nürnberg. When an Asian woman with long black hair took a Welt im Wandel (Emergence Quarterly), she asked why we were standing there. Our banners featured S.O.P. [Save Our Planet] and Maitreya’s priorities like sharing and justice. She said she did not understand because we Germans live a good life and German industry was still selling well; why worry? I was not sure whether I understood that she did not care – but she confirmed this. I answered that I thought the price for the good life was too high since we poisoned air, water and the soil, the basics of life. After we had briefly touched on politics, economics and the environment there was still “a question mark on her face“ and I felt that I was being tested for a moment. So I told her about the immense support we will get from Maitreya and the Masters as soon as enough people step forward. She nodded – test passed? – and said twice that she thought we were doing a good job. Because of that change of mind and test I wondered whether she might have been a spokesperson for a Master. Also I asked myself whether I should have told her about the Spiritual Hierarchy earlier in our exchange. Photograph taken by M.T. in January 2016 at Honchou, Higashimurayama-shi, Tokyo, Japan, of light patterns manifested by Maitreya and the Space Brothers. Y.D.-M., from Paris, France, took this photograph on 25 November 2015 by the Pergola, in Hampstead Heath, north London, showing a column of light. These photographs were taken within minutes, in October 2015, when we were visiting a dear friend in Biel, Switzerland. In the background of one of the photographs the Bieler Lake can be seen. After development all of them showed a column of light. Were the light columns blessings? Sent by T.W., W.N., J. A., Regensburg, Germany. I bought a bunch of salmon-coloured roses for myself on my birthday, on 10 October 2015. I divided them into two slender vases and cared well for them. I can always enjoy my flowers a long time. After one-and-a-half weeks when the roses were decaying and I wanted to discard them, I noticed that three flowers were developing new side-branches with new leaves from the main branch, while the old branches and many leaves had already died. Enclosed is a photo which clearly shows the reddish and light green new branches and leaves, and the dark green decaying leaves and the old rose. I was astounded. So I kept these three flowers in the vase and they kept on growing, more branches and bigger new leaves and no sign of any roots growing. This was going on for about a month. Was this a miracle? B.D. from Gorey, Co Wexford, Ireland, sent a collection of family photographs, all of which were confirmed to show light blessings after development. These three photographs show blessings from the Master Jesus. B.D.’s grandniece C. with her family at her Christening on 6 July 2008. B.D.’s grandniece K. on Christmas Day 2007. B.D.’s nephew J. with his mother on his Confirmation day, 31 March 1998. 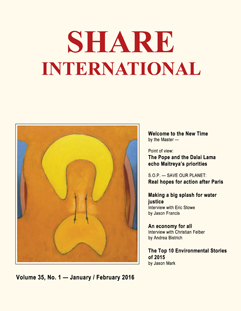 Share International presents extracts below from recent talks by the Pope and the Dalai Lama. Delivering his traditional ‘Urbi et Orbi’ address on Easter Sunday, Pope Francis preached a message of hope, calling on people not to let fear and pessimism ‘imprison’ them. Speaking to a crowd of thousands outside the Vatican, His Holiness urged the world to use “weapons of love” to combat the “brutal violence” of terrorism. "Let us not allow darkness and fear to distract us and control our hearts," he said. The Pope also called for dialogue between Israelis and Palestinians and resolutions to end conflicts and political tensions in Yemen, Syria and the many troubled countries throughout the world. He expressed hope for ground-breaking policies capable of assisting and protecting the victims of conflicts and other emergencies, especially those persecuted for ethnic and religious reasons. “O Cross of Christ, today we see you in the Mediterranean and Aegean Seas which have become insatiable cemeteries, reflections of our indifferent and anaesthetised conscience,” he said. “Looking for peace doesn’t mean there will be no more conflict, we will always face problems, but we have to learn to deal with them through dialogue. This is important if this century is to avoid the bloodshed of the 20th century. We seem to have prayed for peace for hundreds of years without much effect. We have to act to achieve it. On all sides, the portents of major change are appearing, creating an atmosphere of expectation almost tangible in its potency. Everywhere, new ideas are emerging, new patterns are being created, new and healthier approaches to living are being advocated. All of this points to man’s readiness for a great step forward, itself the response to an expansion of conscious awareness. Man is growing in stature every day. Despite all appearances, notwithstanding the ugliness and cruelties which abound, man’s inner divinity is gradually shining through, and gives joy to the hearts of Those of Us who work on the inner side of life. Wherever you look throughout the world, the response to My Message can be seen. The principle of Sharing, basic to men’s lives, engages the minds of the leaders. A growing group of such awakened men sound the keynote of the New Time. Thus gladly do I see the response to My work. Throughout the world, there is a growing understanding that humanity is undergoing a profound change in consciousness. This reflects itself in many ways, not least in the efforts being made to explore the nature of consciousness itself, to investigate the connection between consciousness, mind and brain, and to study the effect that these three, singly or in unison, may have on matter and the natural world. The old, mechanistic views of nature and of the forces at work within her are fast disappearing and a new awareness is dawning of the unity underlying all manifestation. More and more, the concept that all is energy, that energy and matter are different states of one reality and can be affected by thought, is being accepted on a wide scale and is changing men’s view of life. Enlightenment is growing apace and soon the methods and technology will be found to demonstrate this fact. This is of profound significance for the future evolution of the race. As we enter the new age, a new urgency is being felt to explore the outer and the subjective worlds and to understand the relation between these two aspects of creation. Many scientists around the world are bending their enquiries in that direction, prompted by the need to demonstrate and prove their intuitive belief that all is interconnected. The acceptance of a super-personal self or soul is gradually gaining ground and is leading to a new synthesis in men’s view of reality. Men stand at a point of revelation, which soon will sweep away discordant voices and attitudes. They will know more keenly the meaning and purpose of their existence, and the means by which that knowledge is brought into their awareness. Soon, very soon now men will grow, overnight as it were. Down the ages, man has ever sought the light which he senses to substand his ignorance and fear. When threatened by some dark and awesome catastrophe, real or imagined, he instinctively turns inwards, invokes the light of his soul, and seeks guidance therefrom. Such action is but natural, for deep within the consciousness of every man, woman and child lies the awareness of being a soul. As progress upon the evolutionary path is made, that certainty deepens, the conscious link between the soul and its reflection strengthens, and the light of the soul the more readily is contacted and known. Thus the light of understanding grows. Evolutionary progress up to now has been to fashion individuality. That has to be achieved before it can be overcome. The potent, self-serving, highly integrated individual has to give way, eventually, to the world server. The essence of Aquarian consciousness is the concept of the group…. In all history there has never been a time like the present. Never, in all the cycles which have left their mark on man’s evolution, has there been the same potential for change. This time, therefore, is unique. It portends a change in consciousness so dramatic and far-reaching that new definitions and vocabulary must evolve to describe man as he will become. The main factor in this profound event will be the influence of man’s Elder Brothers, the Masters of Wisdom, led by Maitreya, the Christ and World Teacher. It is impossible to overstate the effect which Their Great Approach will have on the lives and thoughts and behaviour of men. As plumber Tommy Rosa stepped off the curb one night in his Bronx, New York neighborhood in March 1999, a car mowed him down and sped off into the night. Only Carlos, from the store across the street, heard the noise and looked out to see a diaphanous, bright white form rise out of a dark mass lying in the street. He called for emergency help. Doctors put Tommy’s body on life-support at the local hospital where he lay in a lengthy coma. During that time, Tommy says he “went to Heaven” where his Teacher taught him truths that could restore health and happiness to those who implement them. After Tommy returned to his body, his long recovery included meeting a New York City cardiologist and psychotherapist, Dr Stephen Sinatra, who had a deep interest in the near-death experiences he had been cataloging in his 40-year practice. This book is the product of their collaboration: Tommy’s revelations coincide with truths that Dr Sinatra’s medical experience has revealed: by transforming our attitudes, relationships and habits, we can heal our bodies, abolish our fear of death, and live joyfully. Tommy recounts that his Teacher created scenarios in which he could experience eight revelations of truth to share with others in his earthly life: Connection, Faithfulness, Vital Force, Grounding, the Body Temple, Positivity, Self-love and Purpose. Dr Sinatra discusses the scientific verification of each revelation from a medical perspective, and lists directives for applying each revelation to one’s life. As he moves through heaven, Tommy experiences a connection with nature that he had never felt before – a real interconnectedness coupled with overwhelming “unconditional love”. His Teacher explains the revelation of connectedness – that everything, seen and unseen, is connected to everything else, and that it is a living, divine interconnection. To experience the revelation of faithfulness, Tommy’s Teacher takes him to an ocean. As they walk into the water, Tommy sees many aquatic animals floating by and feels the connection, but realizes that his Teacher has disappeared. Suddenly, some dark shapes approach – great white sharks with open mouths. Tommy panics, then hears a strong voice say: “Have no fear.” Tommy thinks a sarcastic thought, then hears the voice again: “Have no fear.” After closing his eyes to regain composure, Tommy opens them to find the sharks have disappeared and his Teacher has returned. His Teacher tells Tommy that the body is a house, or temple, for the soul, and that his job is to keep the house clean and healthy so that the soul can grow in experience. We can make ourselves sick and unhappy, Tommy writes, but we can also change our habits and become healthy again. Further, his Teacher says: “Your thoughts are actions too. They begin a chain of events, positive or negative, just as if they were physical actions. Know too that every thought you and everyone else has is recorded here in Heaven, and you are responsible for them. You are a collection of your thoughts and actions.” And as many are beginning to know, those thoughts and actions make our lives what they are. In the chapter The Revelation of Self-Love, his Teacher explains to Tommy about loving one’s self without ego, unconditionally. This self-love, he says, is the essence of connecting to divine love, which is the source of miracles and joy in life. Ego, which demands satisfaction and reward, is, with fear, the source of all destruction in life, all wars, all hatred, anger and deceit. These “twin forces of destruction,” as the Teacher calls them, are the consequences of separation from God. The solution, therefore, must be to turn back to divine love, and truly forgive ourselves and others. Dr Sinatra discusses the physical effects of love, and, conversely, abuse and neglect, by reporting on scientific studies and his own clinical experience, which confirm Tommy’s revelation on self-love. When it comes to Tommy’s question as to the purpose of life, his Teacher answers simply: “… to grow spiritually. Live through the heart ... become an example of Divine Unconditional Love ... share your gifts. Living through the heart raises your vibration high enough to maintain optimal, vibrant good health.” But, the Teacher adds, mistakes are normal and to be expected. Just see them as opportunities for self-improvement. Forgive yourself and others, and you will increase your self-love, your vibration, your health and joy. The reader comes away from Health Revelations from Heaven and Earth with a sense of comfort and hope – perhaps a renewed love of life and living without fear – especially the fear of death. As Tommy says: “... there is no real death and when our time comes it will be like walking through a door to our real ‘Home’”. Restorative Justice for Oakland Youth (RJOY) is a nonprofit group founded in 2005 and based in Oakland, California, USA. RJOY works in schools and the criminal justice system to interrupt cycles of youth violence, incarceration and damaged lives due to punitive school discipline and juvenile justice policies. Fania E. Davis, a civil rights attorney, co-founded RJOY and is the group’s director. Jason Francis interviewed her for Share International. Share International: How would you describe the approach our current US criminal justice system takes in addressing wrongdoing? Fania E. Davis: Our current approach is sometimes called retributive, which means our response to the original harm is with another harm that is punishment. So you can say that ours is a system that harms people who harm people to show that harming people is wrong. SI: What effect is this approach having on the lives of individuals who go through the criminal justice system, as well as society as a whole? FD: It’s having a very destructive effect. We know that when people are harmed they go onto harm other people. So basically our culture and lives become saturated in harm. That’s what we see all around us today. Of course, it’s a punitive approach, whether racialized mass incarceration, three-strikes laws [increasing the chance of a person receiving life imprisonment when convicted of a third felony], increasing incarceration of women, and families and communities being torn apart because of mass incarceration. This punitive response to wrongdoing pervades every aspect of our lives. I see that in my work everyday with students: schools are starting to look more like prisons, with a heavy police presence, metal detectors and wand searches. This approach has wreaked havoc on the lives of people in our country, especially people of color. We see what scholars call a “prisonization” of our culture. And it’s especially noticeable in schools. SI: How would you define the approach that restorative justice takes? FD: Restorative justice takes an holistic approach. Instead of asking “What laws were broken?”, “Who broke them?” and “What punishment is deserved?” as the current system does, restorative justice asks “Who is harmed?”, “What are the needs and responsibilities of those impacted by the harm?” and “How do those impacted come together to figure out how to heal the harm as much as possible and address needs and responsibilities?” It’s a justice that seeks to heal the harm and repair the damage to relationships that has occurred as a result of the crime or other wrongdoing. It seeks to create more social peace. SI: Where does the concept of restorative justice have its roots? FD: Its earliest roots are in indigenous ways of addressing conflict or doing justice. Or you could say the fundamental indigenous insight that gives rise to restorative justice is the belief that we are all related to one another and to the Earth. Ubuntu is an expression of this fundamental African and indigenous belief. It basically says, “I am because we are, and we are because I am.” I am who I am because of my relationships. That relational essence of restorative justice comes directly from the teaching and insights of almost all indigenous cultures. We use the Peacemaking Circle process in our approach to restorative justice. That came from the Tlingit Tagish indigenous people in Canada. Kay Pranis, a leading theoretician and practitioner of the Peacemaking Circle, taught us this process. She learned it from the Tlingit Tagish Elders. We find that these circles are common to many indigenous cultures, not just in Canada, but also in Africa, Asia and Latin America. SI: Could you talk about the role of the Peacemaking Circle in restorative justice? SI: How does restoration take place when someone is in jail or prison? FD: Typically, in these cases, persons who commit homicides will go through the normal criminal justice process, but after they have been sentenced and are serving time we might have what’s called a victim-offender dialogue where the survivors, the family members, meet with the killer. This is a very delicate process, as you can imagine. There is a trained facilitator who works with each side over a period of time before actually bringing them together. Just amazing healing happens. In many cases after these processes the family members become close to the killer, and actually support the killer’s release on parole. A new movement is rapidly sweeping France as protesters occupy French cities calling for change. Roughly translated ‘nuit debout’ means ‘night standing’ or ‘rise up at night’ and was initially a social-media-driven protest movement against labour law reforms that make it easier for employers to sack workers. However, after the first week, now vast nightly gatherings of people of all ages and backgrounds began to occupy large public spaces in more than 30 cities in France. The new citizen-led movement is being compared to the Occupy Movement or Spain’s Indignados. As night falls over Paris, thousands of people sit cross-legged in public spaces, taking turns to pass round a microphone and denounce everything from the dominance of Google to tax evasion or inequality on housing estates. The debating continues into the early hours of the morning. It has expanded to address a host of different grievances, including the state of emergency and security crackdown in response to last year’s terrorist attacks. Various committees have sprung up to debate a new constitution, society, work, and how to occupy the square with more permanent wooden structures on a nightly basis. Whiteboards list the evening’s discussions and activities – from debates on economics to media training for the demonstrators. “No hatred, no arms, no violence,” was the credo described by the “action committee”. “This must be a perfect mini-society,” a member of the gardening committee told the crowd. A poetry committee has been set up to document and create the movement’s slogans. “Every movement needs its artistic and literary element,” said the poet who proposed it. “Generation revolution”, was scrawled on the pavement. The concept behind the movement is a “convergence of struggles” with no one leader. There are no union banners or flags of specific groups decorating the protest in the square – a rarity in France. No issue is “off agenda”; social problems such as labour laws, inequality, injustice, climate change, the refugee crisis, racism and more are all debated through the night.